(PRLEAP.COM) April 9, 2014 - Rebecca Hobbs DMD, MAGD of Augusta GA received the Orkos Award for providing the most comfortable and effective periodontal treatment for her patient with Parkinson's disease. 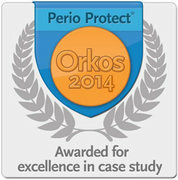 The Orkos Award honors dental professionals for excellence in case study. In this case, Dr. Hobbs is recognized as a compassionate provider who offered excellent individualized treatment and took seriously the important role of a caregiver in periodontal disease management. Gum disease is a chronic inflammatory response to bacterial communities that infect tissues in the mouth. The symptoms range from bleeding gums, to bad breath, to swollen gums, to loose teeth. The first line of defense against the disease is patient homecare. Brushing and flossing mechanically remove the bacterial communities, called biofilms, inducing the disease. Patients with Parkinson's disease face many oral health challenges. The Parkinson's Disease Foundation (pdf.org) explains that bradykinesia, a general reduction of spontaneous movement and defining feature of Parkinson's, causes difficulty with repetitive movements like tooth brushing. Moreover, dental office visits may need to be limited due to tremors, rigidity of muscles, a decreased range of muscle motion, or common tightness of the neck and shoulders. Because treatment for gum disease routinely requires multiple, lengthy visits to the dentist with regular three-month recall appointments, the frequency and duration of periodontal treatment is especially difficult for patients with Parkinson's. Homecare was a clear challenge for Dr. Hobbs's patient. Even if a caregiver is largely responsible for everyday personal hygiene needs, as was the case for this patient, tooth brushing can be difficult to perform well, resulting in plaque accumulation and gingival inflammation. This patient exhibited generalized red, tender gums, with periodontal pockets - the spaces that develop between teeth and gums - measuring 4-6mm. In healthy mouths, periodontal pockets are 1-3mm deep. When considering treatment options, "Utmost in my mind," explained Dr. Hobbs, "was providing comfortable care for my patient. I try to treat each patient the way I would want my family members treated. This patient has special considerations. I wanted to keep his appointments as brief and comfortable as possible and I also wanted to help make his homecare easier for better and longer lasting results." Dr. Hobbs recommended starting with Perio Tray® delivery of medication to help reduce bacterial infections, plaque, and inflammation before performing the needed deep cleaning called scaling. Scaling involves scraping the teeth clean above and below the gum line. Often the procedure is so uncomfortable that it requires a local anesthetic. Dr. Hobbs hoped that Perio Tray® delivery would combat the infections in the most comfortable way possible and reduce the amount of scaling needed as well as the time to perform it. Dr. Hobbs asked her patient to wear the prescriptions trays four times a day for fifteen minutes with a small amount of 1.7% hydrogen peroxide gel (Perio Gel®, QNT Anderson, Bismarck, ND) and three drops of an antibiotic (Vibramycin®, Pfizer, New York, NY) in each tray. This schedule was prescribed for two weeks. With help from the caregiver, the patient was able to complete the treatments. At the end of two weeks, the patient returned when the second image was taken. Inflammation had subsided dramatically and tissue health was significantly improved. The most minimally invasive treatment could then be completed. The Orkos Award was founded by Perio Protect, LLC to encourage and recognize the contributions of dental professionals using minimally invasive methods to treat gum disease. "This case caught our attention," explained Tanya Dunlap, Program Development Director at Perio Protect, "because of the concern Dr. Hobbs showed for her patient's comfort and convenience. We respect and value individualized patient care and congratulate Dr. Hobbs on her excellent approach." 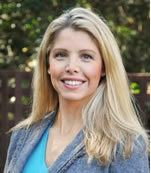 Dr. Hobbs completed her Doctorate of Dental Medicine from the Medical College of Georgia, School of Dentistry in 2001. In additional to the obvious concern for her patients shown in this case, she maintains a high commitment to her dental education through the Academy of General Dentistry's Mastership program in Georgia, and she is one of the youngest recipients of the Academy's rigorous Fellowship and Mastership accreditations. To learn more about Dr. Hobbs and her dental practice, visit hobbsdentistry.com or call 706-955-9516. To learn more about the prescription Perio Tray® or the Perio Protect approach to patient care, visit PerioTray.com or PerioProtect.com. Additional case studies and other Orkos Award winners are available at TheOrkosAward.com.